Writes Sender-Inner Laura S.: "two female lambs who were orphaned at 36 hours old due to the sudden death of their mother. [BAROOoO!!! crying sound - Ed] We had to raise them indoors for the first few days due to ridiculously low temps outside so diapers were a must." Angel (looking at the camera) and Gracie, be... strong! It's the hole for the tail that makes this so precious! I hope they're not feeling sheepish about wearing diapers. They're anerables! I'm going to put one in each pocket and stroll around town. By the way, I hope these behbehs aren't being raised for, like, dinner or purses. If so, the picture would have to go in the Cute or Sad? category. OMGordieHowe! If they aren't the cutest things...i don't know what cute is. In diapers even! GAH! we are poor little lambs who have lost our way. 260Oakley, ewe crack me up! Off topic, but not entirely...taj's comment made me think of something tres qte I saw once: It was a cross-stitched pillow with a sheep on it, and it said, "Ewe's not fat. Ewe's fluffy." It is the tail holes in the diapers that make this so wonderful-bless your hearts and your actions, folks. Lambies!! Let's hope the weather starts warming soon over there so they can have some real frolics through a meadow. No ewe didn't! *ducks bottles* So they had to cut little holes in the diapers to fit the tails? Wonder if that causes leakage. Stay strong little adorable lambies. Not only did they cut holes, they cut them in the right places in the diaper. From the mother of two, now that is artistry. I've got it - LAMPERS!! ThreeCatNight, they make a similar product for piglets: HAMPERS. I would be hard-pressed not to take these little guys to bed. Imagine, counting real sheep to go to sleep. NUFF ALERT, NUFF ALERT...I HOPE THEY ARE NOT FOR FOOD!...WE NOW RETURN TO OUR ORIGINAL THOUGHT...because I love lambs. The way they jump out of sheer joy and the cute little bahs they make. Sweet. Having brought baby goaties indoors I must confess to having diapers on mine as well. DYK: Boys for the boy babies and Girls for the girl babies? It's all a matter of padding, you know? Bwahahahaha! Lambies with diapers! And a baby gate! 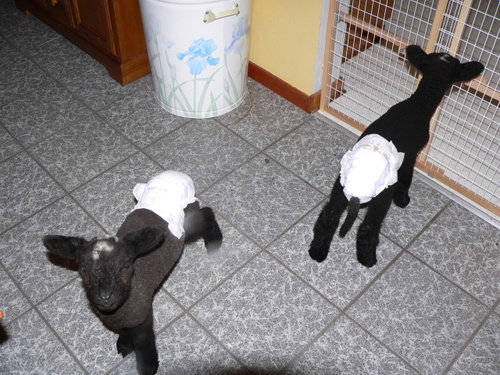 Not just lambie-kins wearing hand-tailored diapers, but BLACK lambie-kins wearing diapers!!!!!!! AHHHHH!!!! My day just improved about 1000%!!!! Tell me about it Sweet Pea. I made lamb shanks for Easter. You can buy dog diapers that have a hole for the tail, I'm guessing that's what the lambs are wearing. Second, one has to ask how many times an hour is that diaper is changed?! :D Personally, I think it's genius! The lambs are NOT going to be food, just so you all know. Since they were orphaned so young and had to be taken indoors for the cold nights, they're thoroughly imprinted on humans, which makes them perfect for breeding for more black sheep (black wool is my specialty). awww LauraSaul it's a shame about the momma but we all love that you are raising the lamby-pants!! very sweeeeeeet!! Laura, my thanks to you. You are a marvelous surrogate mama. The nuffs have been shooed away for another day. I've been redeemed by the cute of the lamb. All my sins are washed away, I've been redeemed. I don't even want to admit how long it took me to figure out what "T.I." means. It took awhile. And Laura Saul - so kind of you to take them in. I raise you a W00T. Lookit Gracie's wool leggins!! Always so sad to hear of mommas having to leave their beebies that way, but you have done wonders with these girls! Bravo, Laura! Black lambs are my most favoritest animules. I'm thinking they'll be worth at least four, not three bags of wool a piece. And that little kid down the lane can buy his own clothes. Thanks for posting, LauraSaul!! You are an excellent mommeh and have a boatload of ingenuity, to boot!! Awwwww. Well they would be adorable even without the diapers. I think baby lambs are the cutest animals on earth. Oh how cute! Maybe when I stumble into the kitchen in the morning in search of my hot dark caffeinated beverage there will be two black lambipants in MY kitchen! PS - the ad directly next to the post creation box for my last post was for incontinence products. @Yitzysmommie---LOL!!! Mine is Free Huggies or Pampers! !